This story is set in post-Revolutionary Mexico and in California during the time of the Great Depression. Esperanza is a girl hailing from a rich rancher's family in Mexico. Growing up she is showered with plenty of love and attention from her family. The campesinos (peasants) are always available to do the menial work. Though the family of Alfonso, the right hand of her father, comprising of Alfonso, his wife Hortensia and son Miguel are with Esperanza's family for a long time, there is still the class difference, the boundaries of which are not crossed. With a strong sense of entitlement, Esperanza learns to differentiate early on between herself and Miguel, even though she likes him a lot. Tragedy strikes the family a day before her 13th birthday. Her father is killed by the bandits and her spurious step-uncles try to swindle the family. From riches to rags, stripped of luxury and thrown into penury and with no assurance of safety in Mexico, the family seeks Alfonso's help. He decides to take his family, Esperanza and her mother to California to escape from the evil schemes of the step-uncles and for better work opportunities. Alfonso's brother lives in a Mexican camp in the valley, working the fields and that's where the migrants from Mexico land. As Esperanza sees the squalor and terrible living conditions in the camp, her heart sinks. Confronted with miserable conditions, paltry food, the definite need to work to support themselves, Esperanza is pushed into survival mode.But there is plenty of love to go around, which gives everyone the strength to lift the sagging spirits. Just when the mother and daughter think that at least they have each other,in this crisis time, things get worse. Esperanza's mother falls sick and is debilitated. Now the onus to run the show falls entirely on Esperanza.The grit and determination with which Esperanza fights every little battle - her own as well as the larger issues of the migrants, forms the rest of the story. One of the main highlights of the book, is that each chapter is titled with a fruit name(in Spanish and English), which crops up in that chapter either as a fruit savoured by the people or which has been harvested by them, in that season. The rolling of time is marked by the harvests of various crops.The story is smattered with Spanish words and Mexican proverbs, which was a delight to read. The story itself is loosely based on the author's grandmother's life. The afterword of the author spanning a few pages,is as interesting to read as the story itself. Along with Esperanza's story, the book weaves together the elements of the various issues of that time - The Great Depression, Dust bowl and subsequent migration of people from Oklahoma to California and The Mexican Repatriation. Written in a beautiful language, the book gives a peek into a slice of history, that altered the lives of so many people. 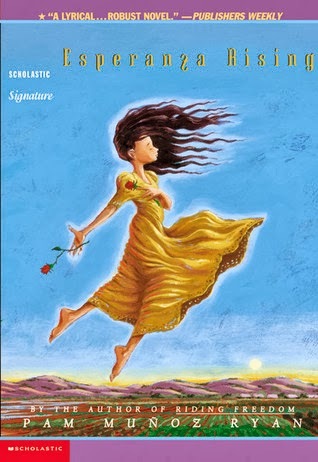 Enriching and thought-provoking, Esperanza (Hope) Rising is definitely worth your book-shelf space ! Ranjani, you have brought alive the book - what a wonderful review! I have read a lot about this book, and now I certainly want to read it. Yes, tales of grit set in historical periods of conflict or desperation can be so inspiring, isn't it? You should read this one set in Australia - around the period of 1880-1910, when the new nation of Australia was formed out of the colonies settled across it, and a 10 year long drought that affected its fortunes, at a time when the women's suffrage movement won the right for women to vote - there is a strong female protagonist, a teenager who rises to the occasion and comes out of it. I have this as a ebook; yet to read it.. Ranjani keeps asking me to; hopefully, soon. It sounds interesting that the book weaves in various political and natural events into it.